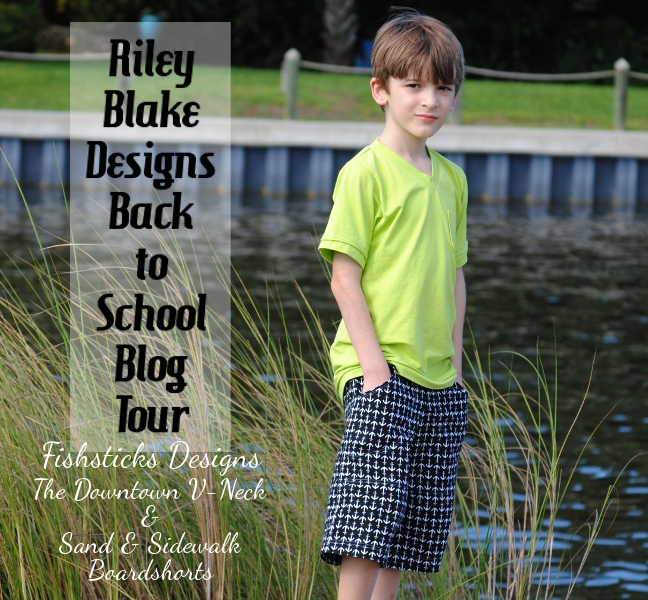 Riley Blake Back-to-School Blog Tour! Do you love giving handmade gifts for Christmas? I do, too! But, who wants to spend the whole holiday season in their craft room sewing? 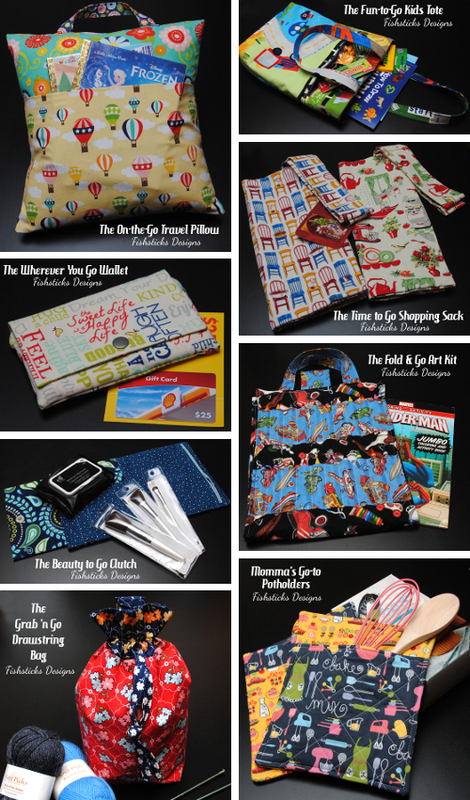 Quick-sew projects that result in gifts the recipient will use and enjoy are the best! 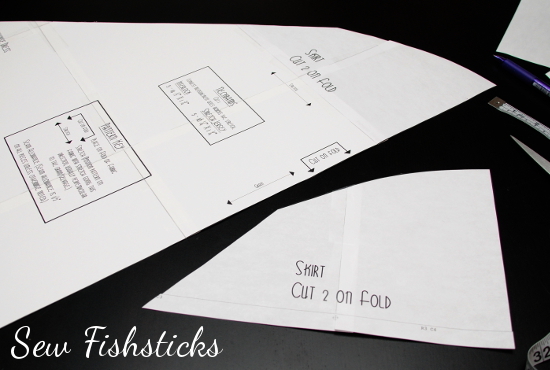 My Go Fish Patterns are some of the quickest around, and at a cost of only $4.25 each, they’re inexpensive, too! 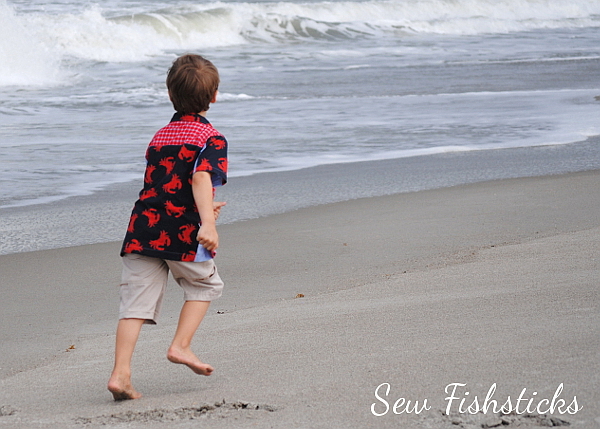 I thought I would take a bit of time to sew up a few Go Fish projects and share some gift ideas with you! Most of these combine a little something store-bought with something handmade. You don’t have to add extras, of course, but sometimes those little things round out a gift quite nicely. 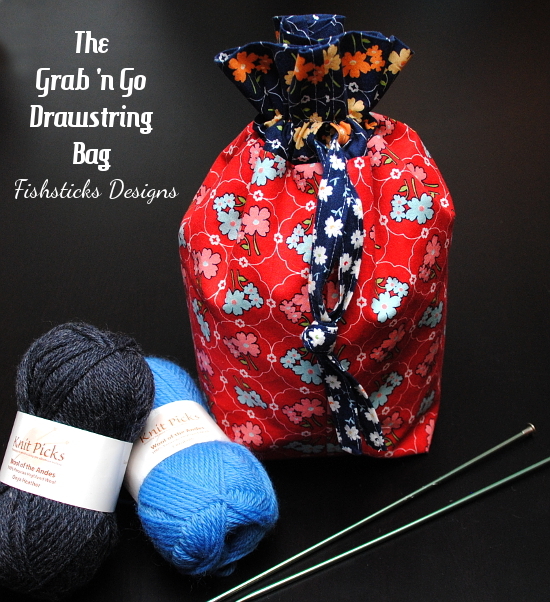 First up, check out those Grab ‘n Go Drawstring Bags in the title image above! 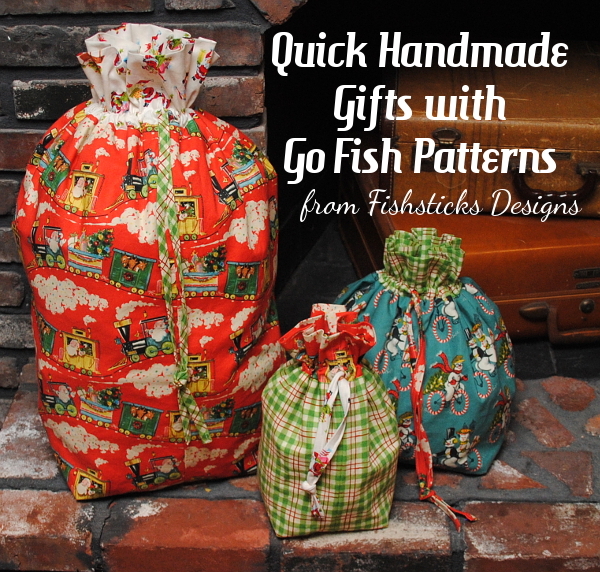 Santa Sacks seem to be the “in thing” this year, and you can sew your own in no time at all! Use one to carry gifts to a party, or sew up one for each of your children to leave for Santa to fill on Christmas Eve. Drawstring bags make great reusable gift bags, too, and it’s really simple to change the dimensions to make whatever size you need! Since we’re already chatting about drawstring bags, they’re a gift that can work for many people on your list! 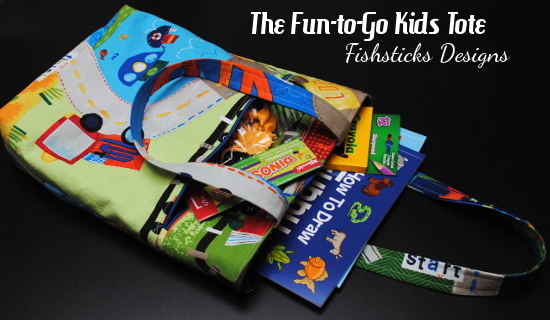 Fill a pretty flowered drawstring bag with yarn and knitting needles for your daughter, or sew one using a transportation print to fill with Hot Wheels cars for your grandson. We have this silly annual Nerf gun battle on Christmas morning at our house, and I’ve learned that little drawstring bags are perfect for keeping track of those little foam darts! 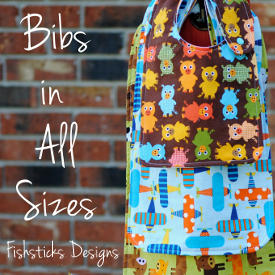 Once you start making these bags, you’ll start finding tons of uses for them. 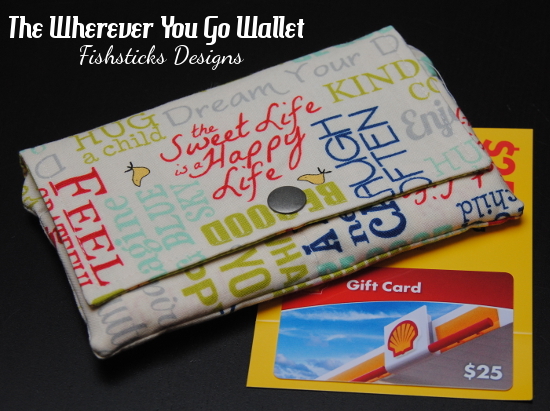 A teen or college-age niece would be thrilled to receive a handmade Wherever You Go Wallet with a gas card or even cash tucked inside! 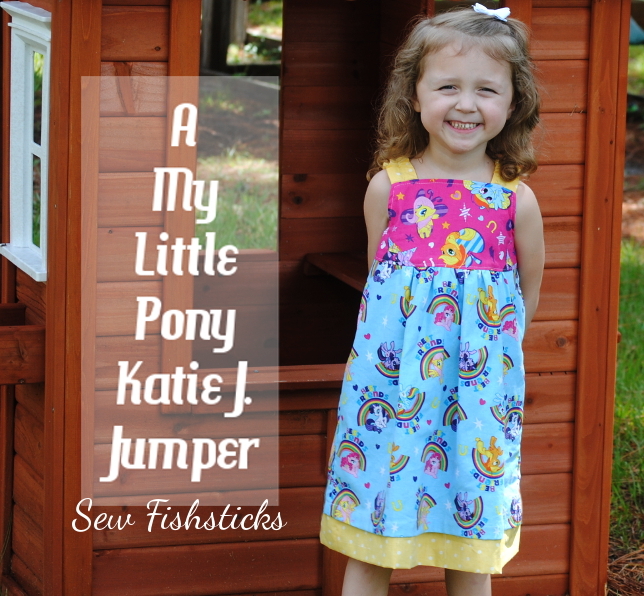 Choose a fabric that fits her personality, and maybe add a matching key fob using my free tutorial, too. Pack a Fun-to-Go Kids Tote with activity books, little toys and snacks instead of filling a stocking, and you’ll have a gift that can be used all year long. Give a set of Time to Go Shopping Sacks with a grocery store gift card for a practical and environmentally friendly gift. 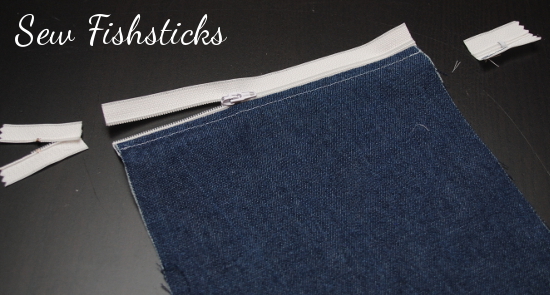 Don’t feel like you have to use traditional fabric on these like I did! 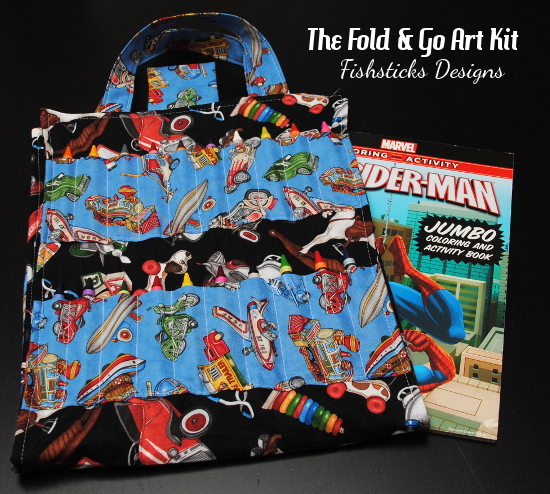 One of my customers sewed Spiderman grocery sacks for her mom who loves comic book superheroes. It’s way more fun to shop when your bags make you smile! 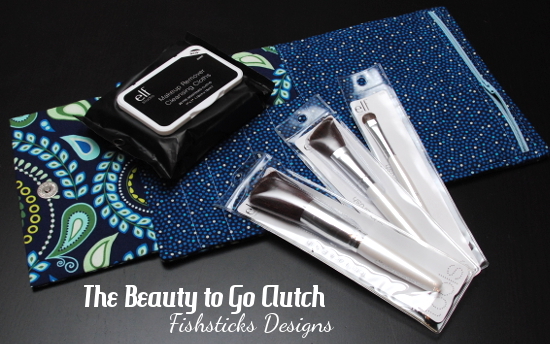 Sew a Beauty to Go Clutch and fill it with new makeup brushes, add your favorite facial wash and perhaps a gift card from your favorite independent beauty consultant or your local cosmetic store. 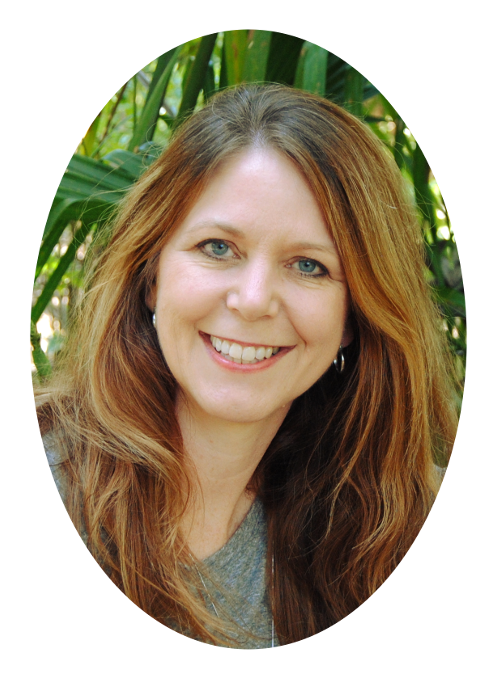 (Support small business owners whenever you can!) Potholders are a fairly traditional handmade gift, and you can really never have too many. 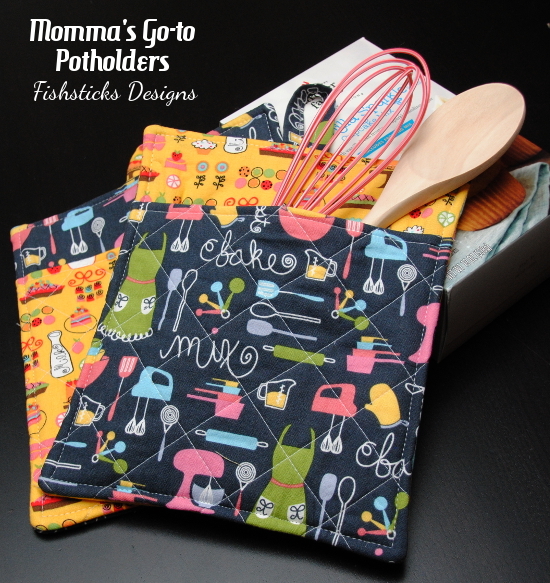 What couple wouldn’t enjoy a gift basket that includes a set of Momma’s Go To Potholders, along with utensils and mixes for their favorite foods? 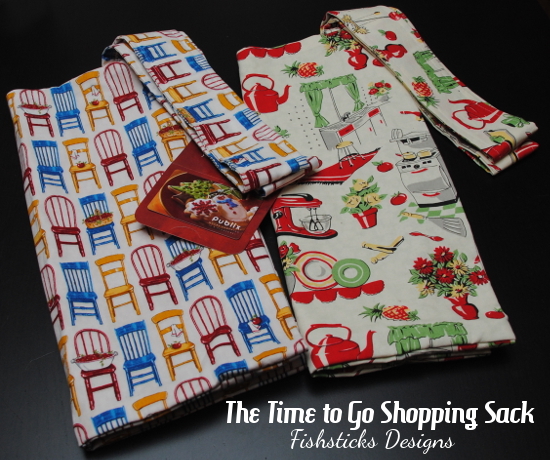 You could even add a Go Bake Something Apron … or a matching set of aprons for husband and wife? The Fold & Go Art Kit with crayons and new coloring books is a quick and useful gift for preschool through elementary. You could even substitute mini colored pencils or mini washable markers. 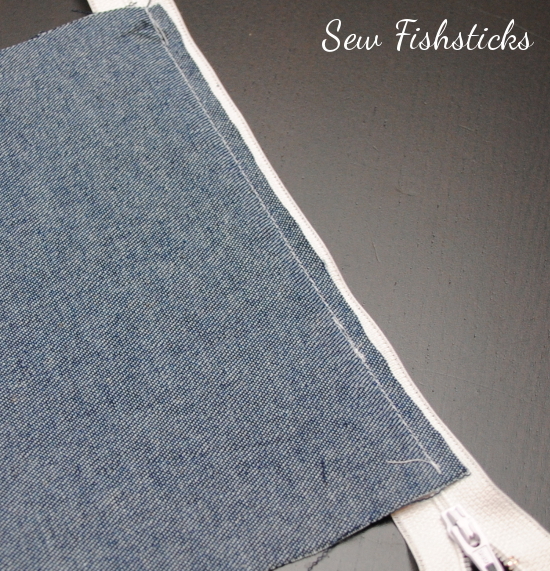 Finally, the quickest sew in my Go Fish series – the On-the-Go Travel Pillow! This one could easily become your go-to night-before-the-party project. 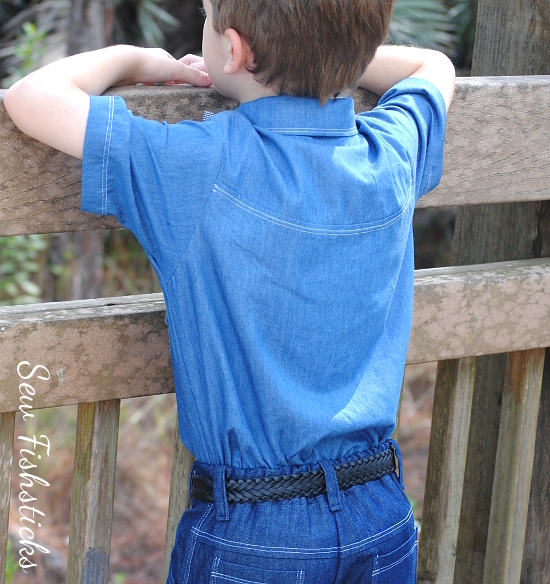 Add a couple of age-appropriate books and this makes a great gift! These are new books, but be sure to check your local used bookstore to build up a stash. Ours carries Little Golden Books for $.50 each! 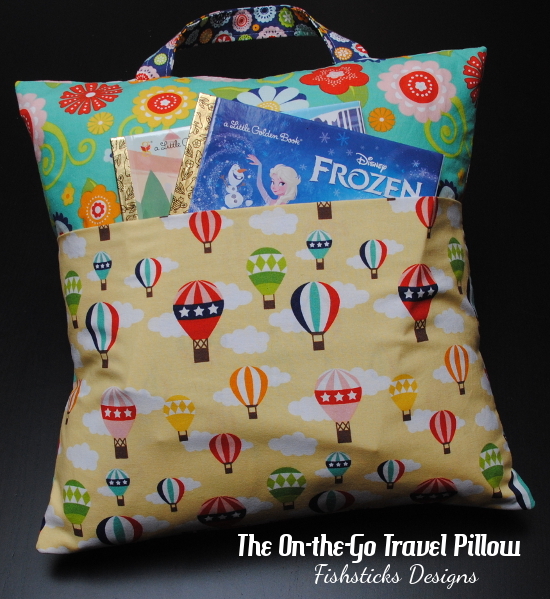 Oh, and these pillows don’t just work for little ones, even teens need a place to rest their heads on trips and at sleepovers. 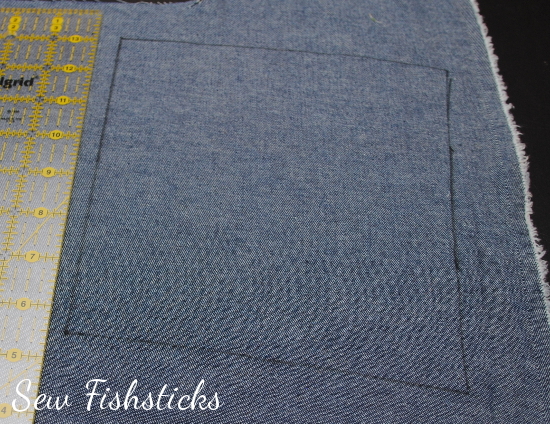 Just choose a fabric that personalizes it for the receiver! 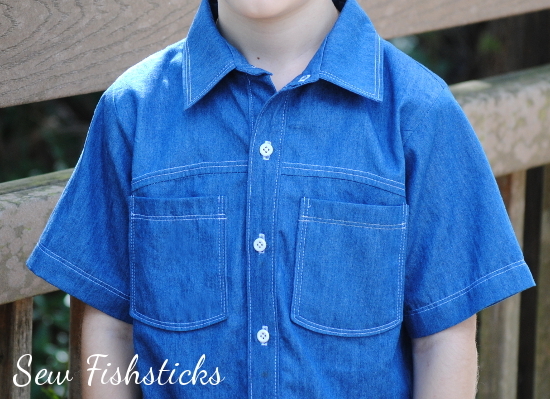 Now all you need to do is go buy your Go Fish patterns, find the perfect fabrics and set aside a little bit of time for sewing! 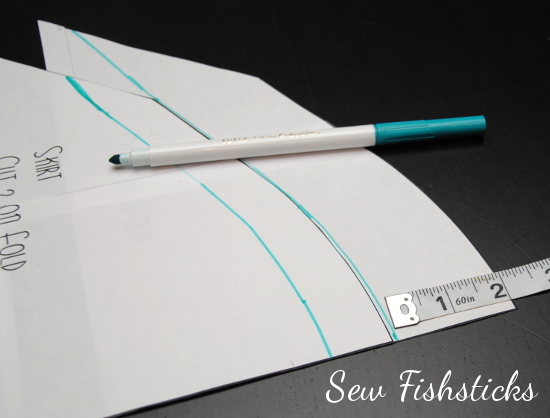 I would love to see what you sew! 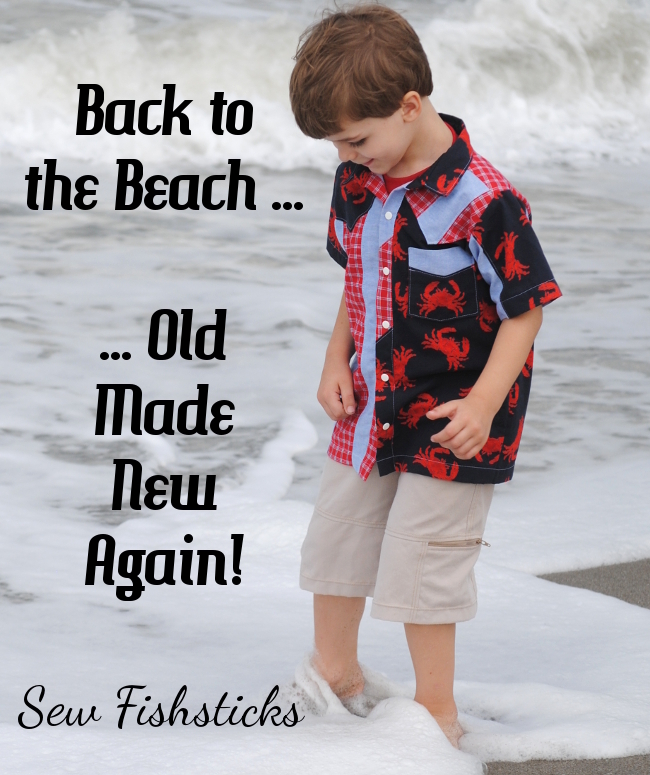 Add a link in the comments, or come join us in the Fishsticks Designs Sewing Group to share! 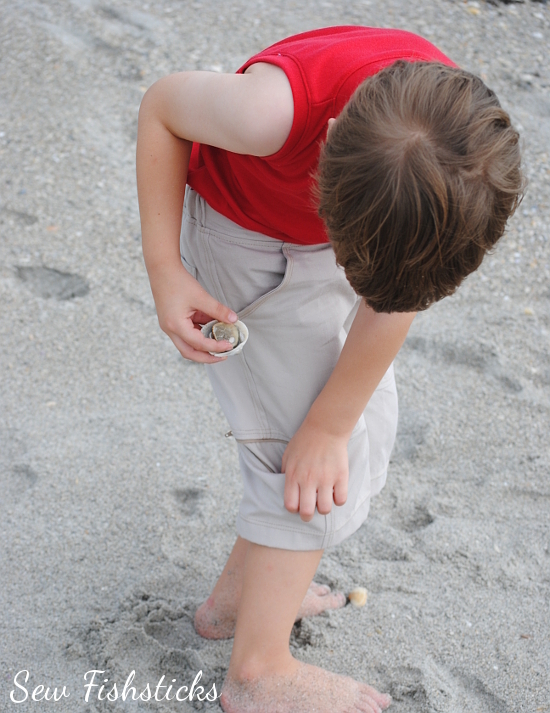 This post originally appeared at Get Your Crap Together in September 2013. 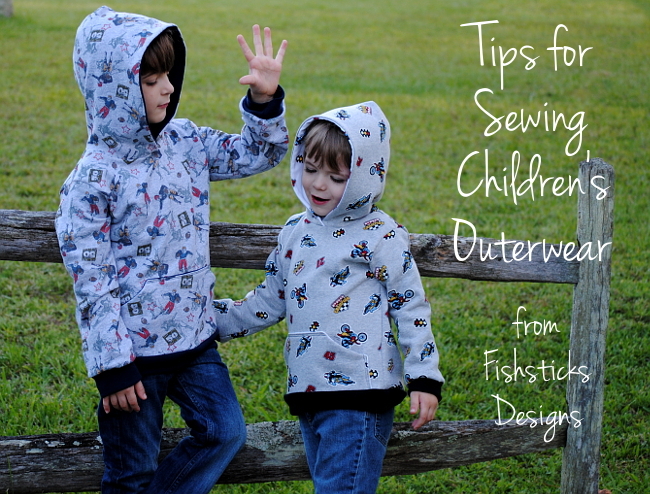 With fall and winter sewing well underway, this is a great time to revisit some of these tips for sewing outerwear! 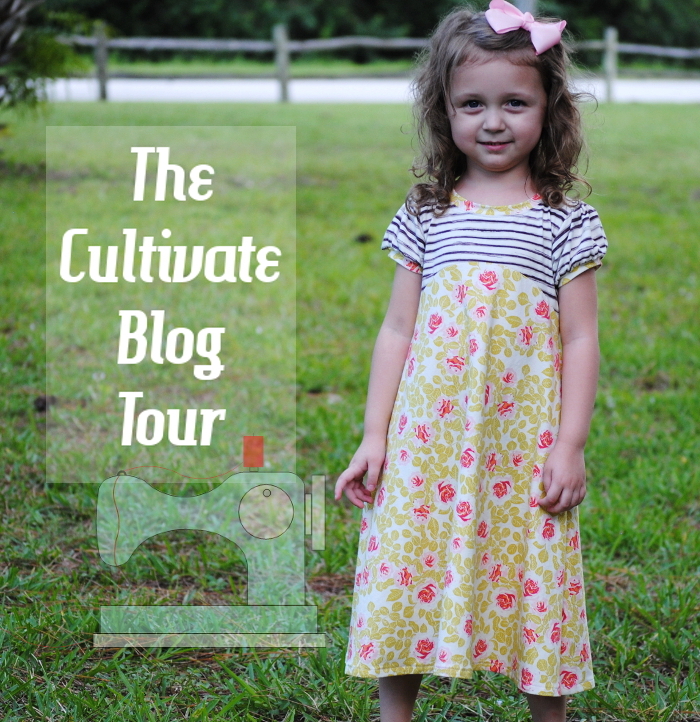 I’m so excited that Chelsea invited me to share some tips and ideas for sewing children’s outerwear. 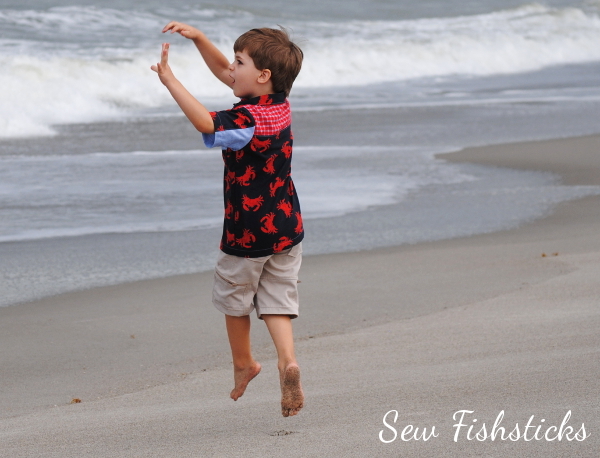 Honestly, outerwear just might be my favorite thing to sew for little ones. 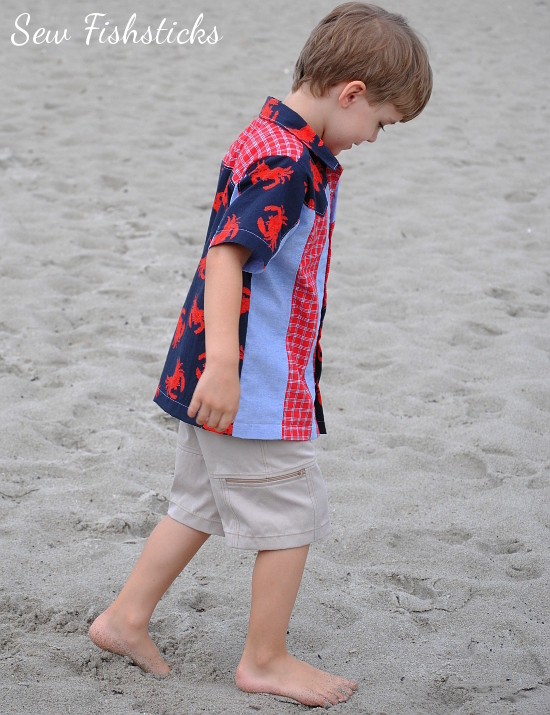 As moms of little ones, our days are full! 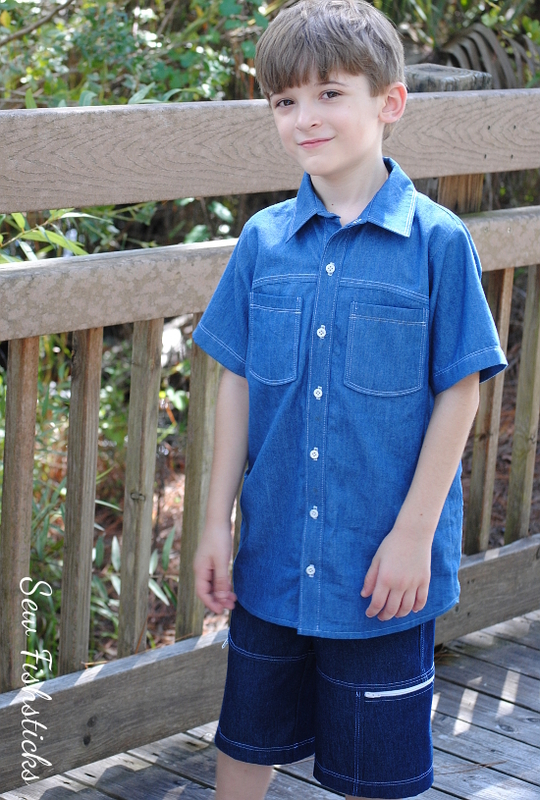 When I’m able to carve out a few spare minutes to sew for my children, I want to spend that time sewing something that will get a lot of use! I want to see the finished work of my hands be enjoyed over and over again. 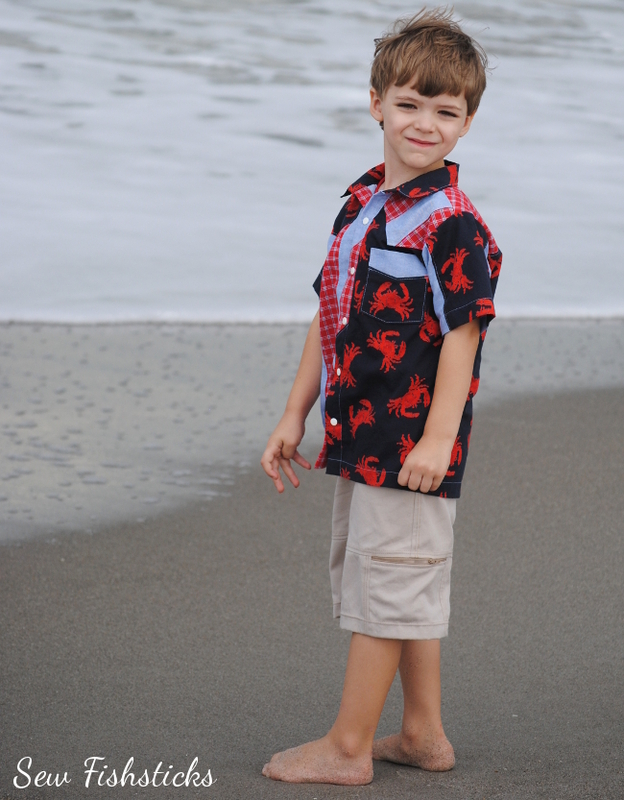 Outerwear accomplishes that goal so well! 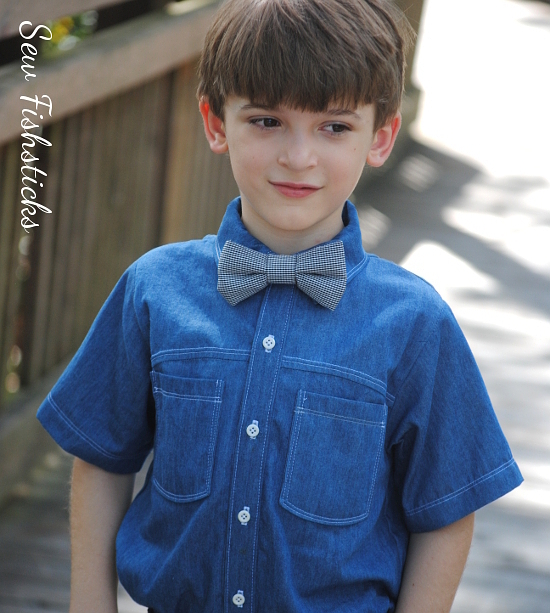 There are some wonderful independent designer patterns available for boys and girls. I really recommend working with independent designers — I’m all about supporting small businesses, and it’s an amazing thing to be able to contact the designer if you get hung up somewhere! Since I design patterns myself, those are the ones that I’m featuring here. The hoodie pattern is my Charlie Tee and Hoodie and the Which Way Out Jacket is the zip-up jacket. The poncho is one that has yet to be released. When choosing a pattern, keep your personal needs and tastes in mind, of course, but be sure to look for those things that make a jacket practical! 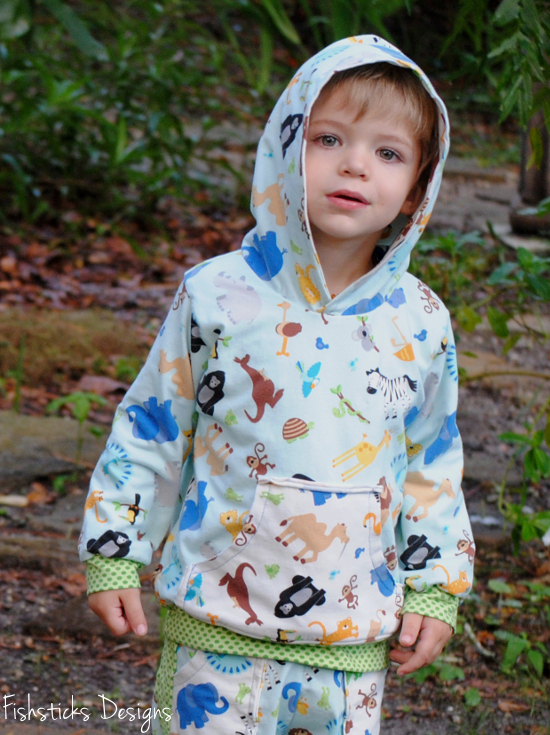 Pockets are really a necessity, and a hood is great for keeping little ears warm without having to keep track of a hat. I mentioned already that I love the amount of use that you get from outerwear, but you get even more bang for your buck if you choose a pattern that is reversible like my Which Way Out Jacket! It’s so cool to have a piece of clothing that is fun and playful on one side while it’s dressy and a bit more reserved on the other. It can be a huge blessing, too, when chocolate ice cream happens to drip down one side, and you can just wipe it off and flip it over! 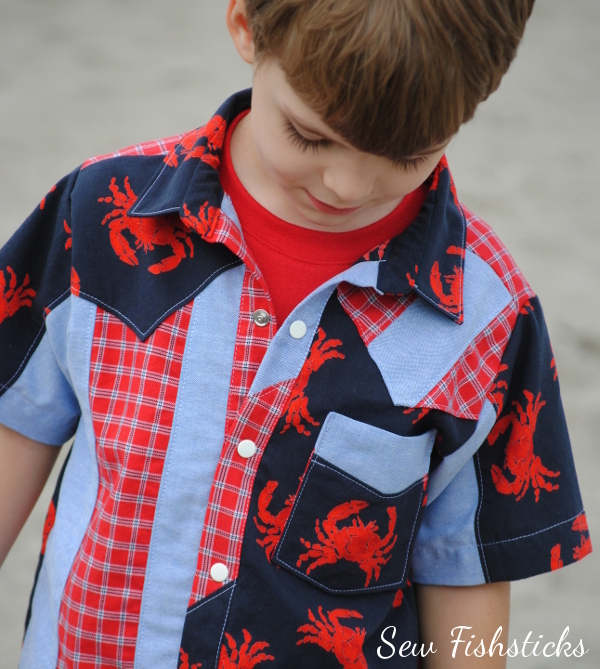 Once you have your pattern chosen, you need to decide on the fabric that you’ll use, and there are so many choices! 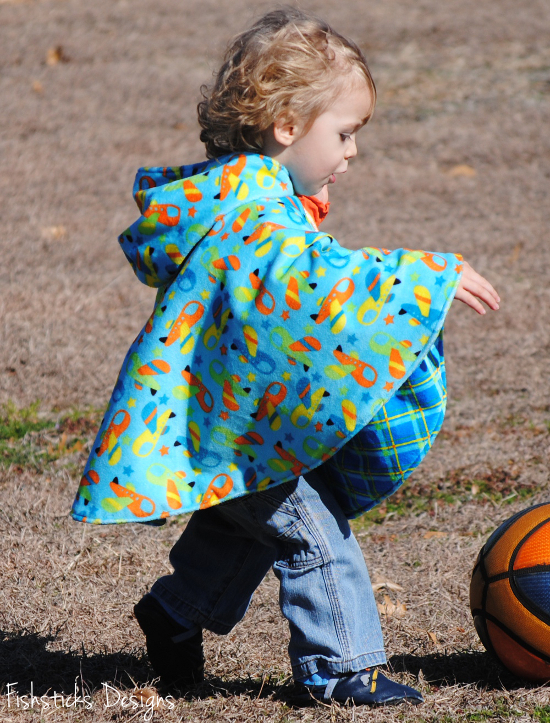 The poncho at the top of this post is sewn with Cuddle Fabric, commonly referred to as Minky. 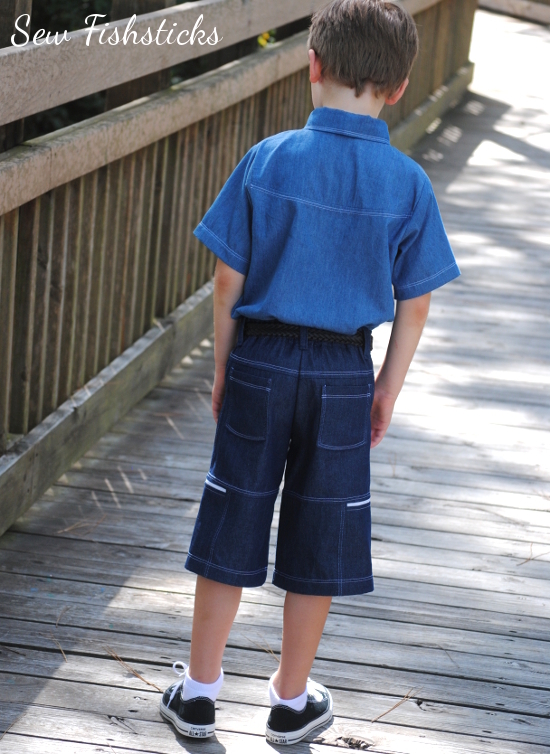 Minky is a polyester fabric that is very warm and fairly heavy, and it has a teeny, tiny bit of stretch. The WWO Jacket just above this paragraph is sewn with cotton flannel on the inside and PUL (polyurethane laminate) on the outside. 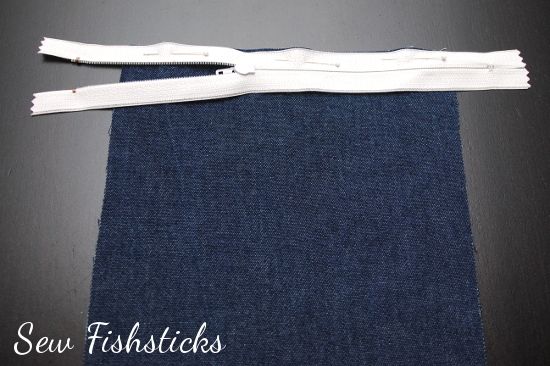 PUL is a polyester fabric that has a laminate fused to the wrong side. 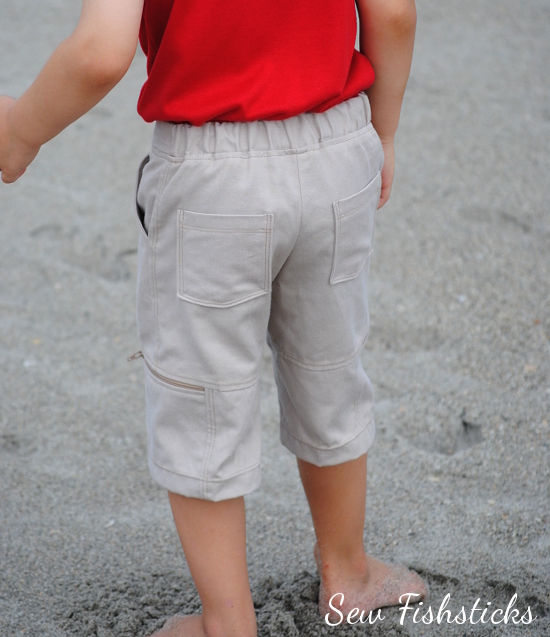 It’s commonly used by cloth diaper makers, and is completely waterproof. 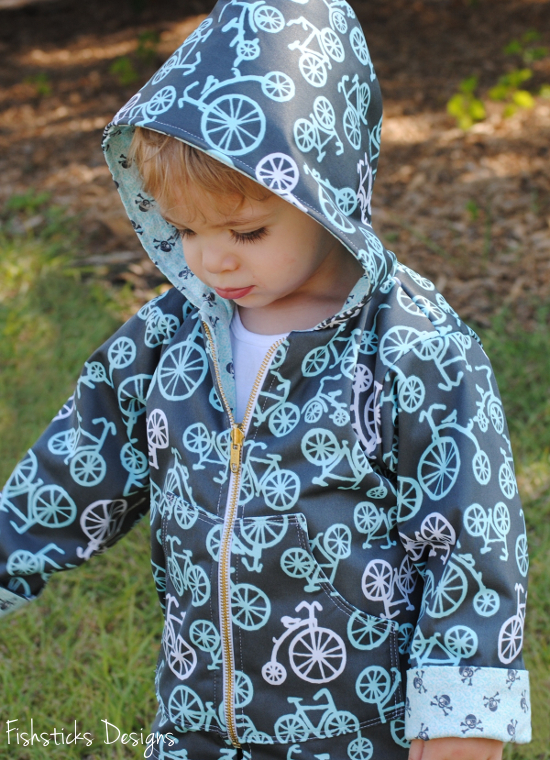 It makes a perfect rain coat or windbreaker! The hoodie above is a great lightweight choice sewn with cotton stretch jersey. Other t-shirt knits are good choices for that little extra layer when the air is just a bit crisp, too. 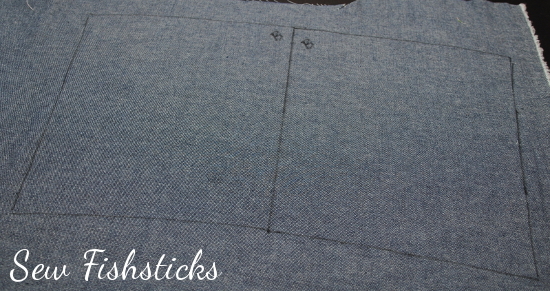 Cotton interlock tends to be my personal go-to since it’s a bit thicker than jersey but not sweatshirt-heavy. 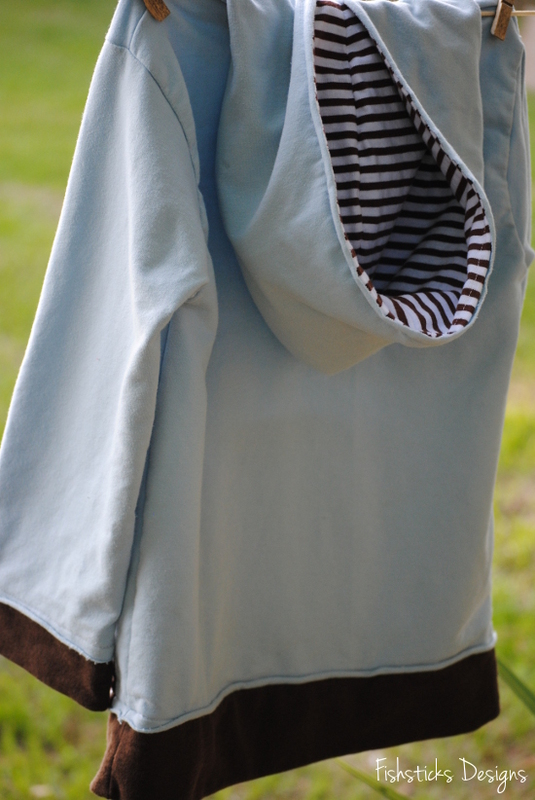 The hoodie above is sewn with cotton french terry. 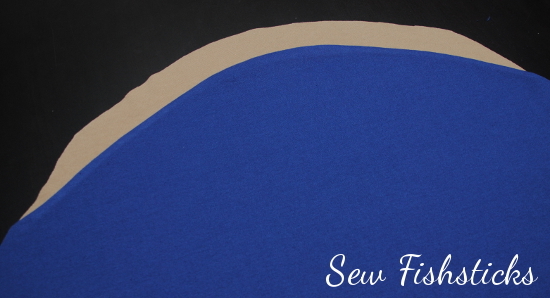 French terry has a right side that is smooth and a wrong side with little loops on it. 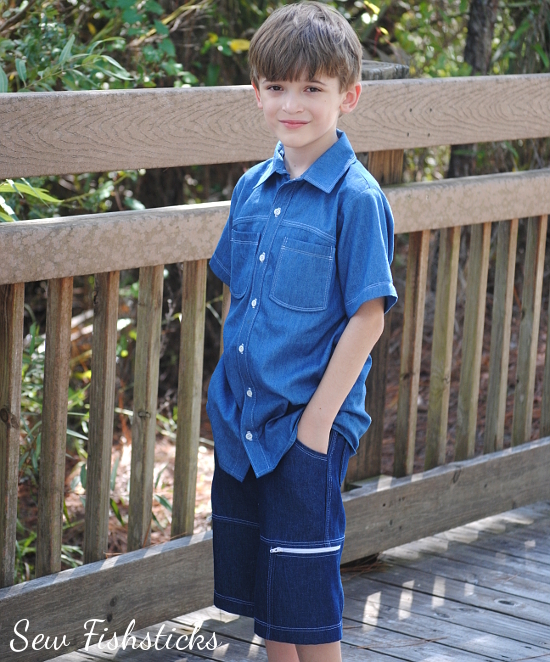 You can find it in 100% cotton and in a cotton/spandex blend, usually referred to as stretch french terry. The first has a little bit of stretch, while the second has a good amount of stretch and recovery. French terry is heavier than the other knits mentioned above, but not quite as heavy as sweatshirt fleece. It’s a perfect choice for a hoodie for fall or spring . . . or winter if you live in my neighborhood! 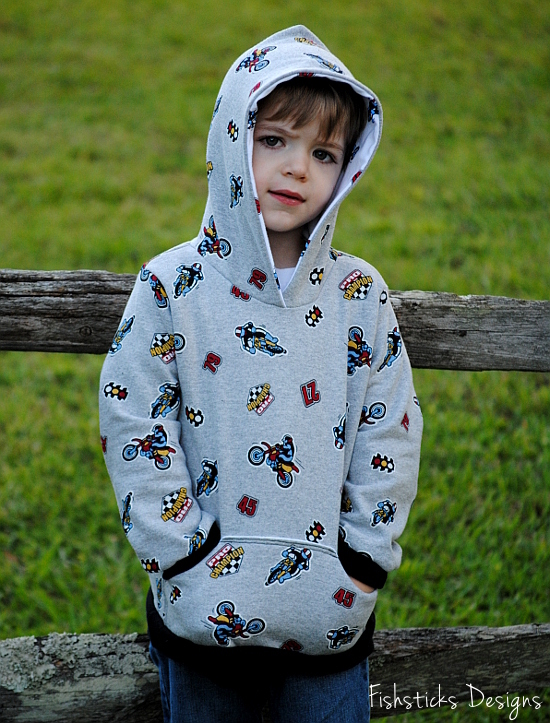 The hoodie below is made with cotton sweatshirt fleece. 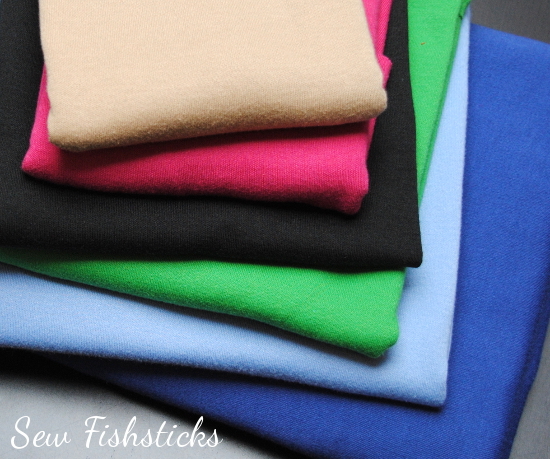 This is the traditional hooded sweatshirt fabric, smooth on the outside, fluffy on the inside. 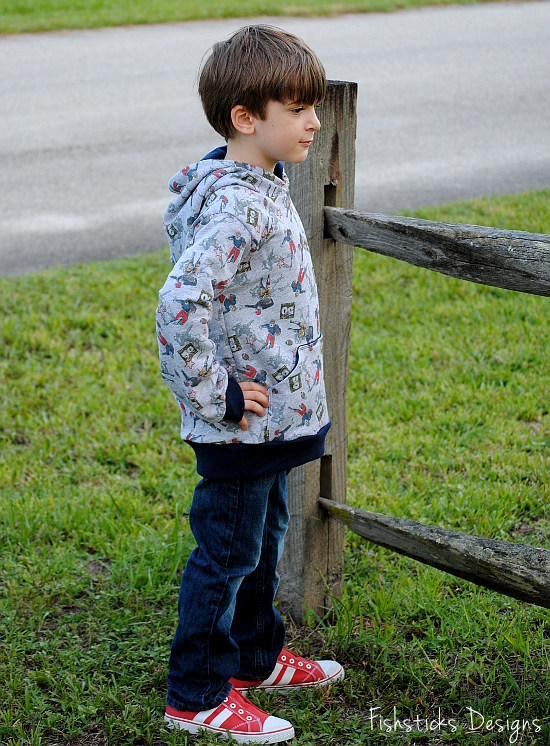 Sweatshirt fleece is generally 100% cotton, and does not have much stretch to it. That makes it easier to sew, but sometimes harder to pull over the head! 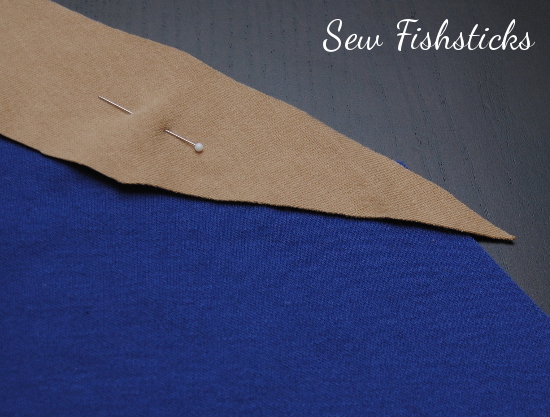 (A little tip if you’re sewing a traditional hoodie for a child with a larger than average head, cut your hood slightly taller — about 1/4″ — than the pattern calls for, and then increase your seam allowance by about 1/8″ of an inch when sewing in the hood. You’ll be amazed at the difference that little bit makes!) 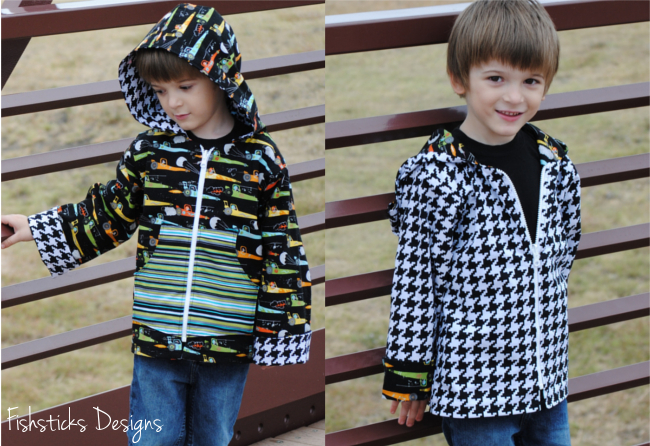 Other good fabric choices for outerwear include cotton quilting fabrics — the reversible cars/houndstooth jacket above is sewn with two layers of quilters cotton, flannel — flannel is a great choice for lining a double-layer jacket, and polyester fleece is another good choice — it comes in tons of colors and prints! 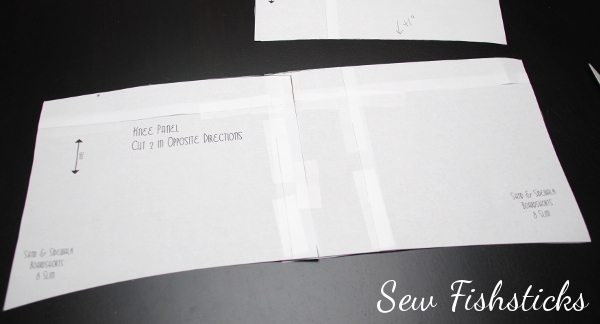 I think many of us look at outerwear as being more difficult or more complicated to sew than other clothing, but it’s really not! There are sometimes a few more steps involved, but I think the extra time is worth the end result. 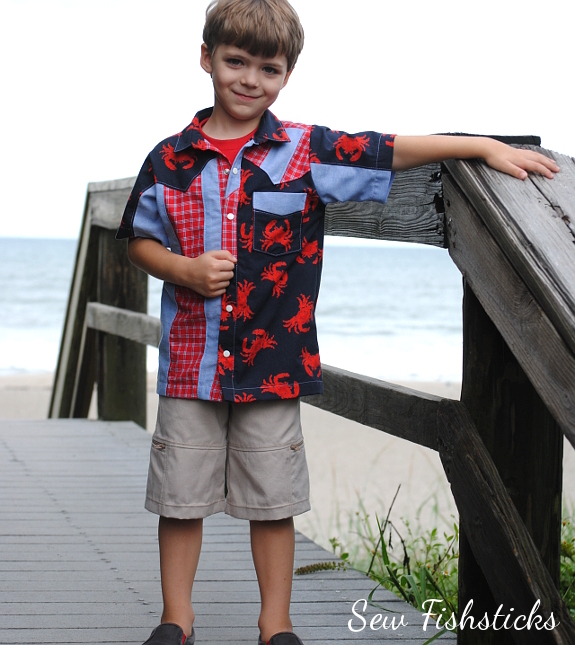 Choose fabrics and a pattern that you love, and go for it. Chances are, you’ll be smiling all season, every time you see your hard work put to use! 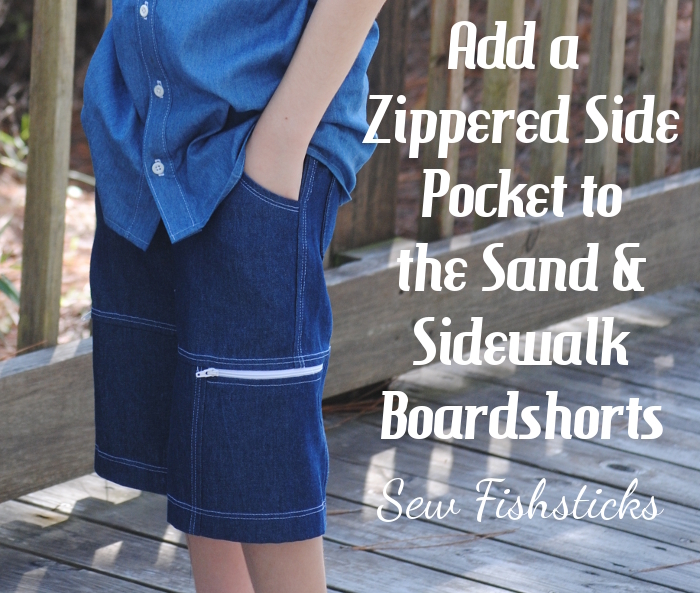 Because you asked, and it makes me happy to make you happy … here are the instructions for incorporating a zippered pocket into the side of the Sand & Sidewalk Boardshorts. Those of us who live in the deep south or in the southern hemisphere will be using this tutorial right away — I promise that I’ll remind those of you up north about it in the spring! 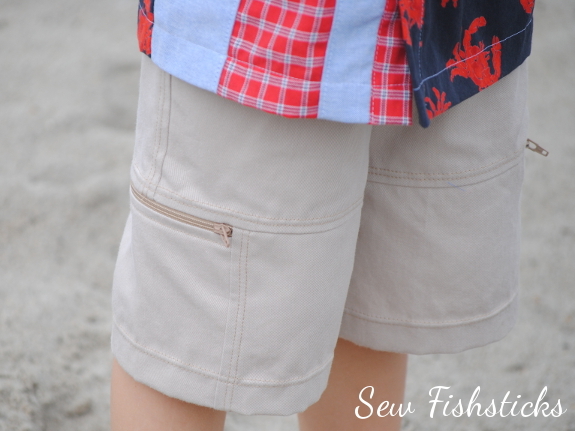 In case you’re not familiar with the Sand & Sidewalk Boardshorts and Skate Pants pattern, a front knee panel is incorporated into both the shorts and the pants. 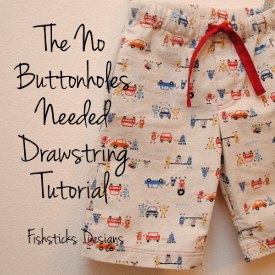 This tutorial is only for the shorts. 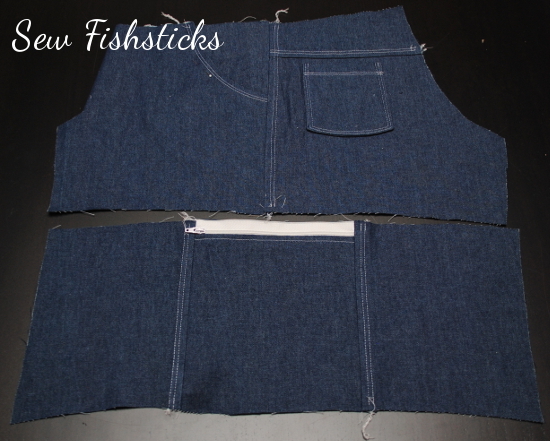 (The curve at the bottom of the knee panel on the pants would make this more difficult.) 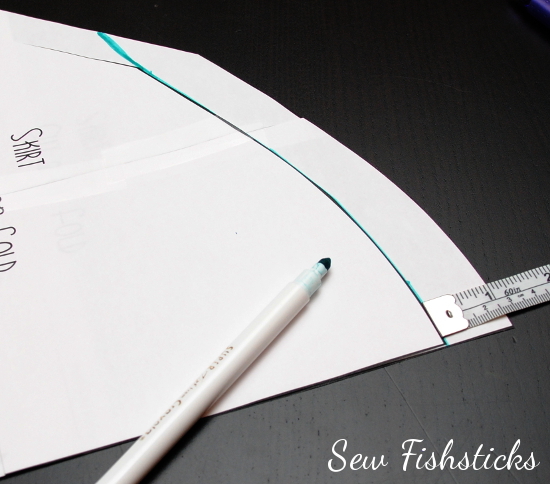 This tutorial is a little long but the most complicated step is drawing in the back portion of the wrap-around knee panel, and that’s not really hard at all! 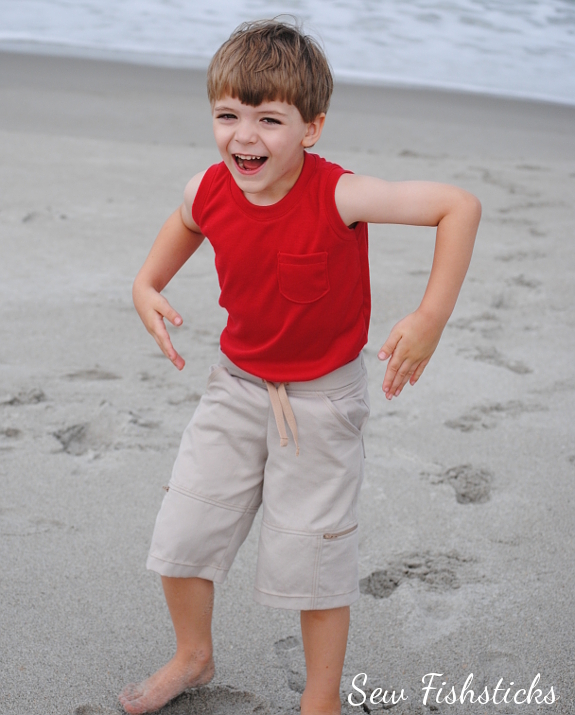 I’ll walk you through each step, and if you have a question, just ask! 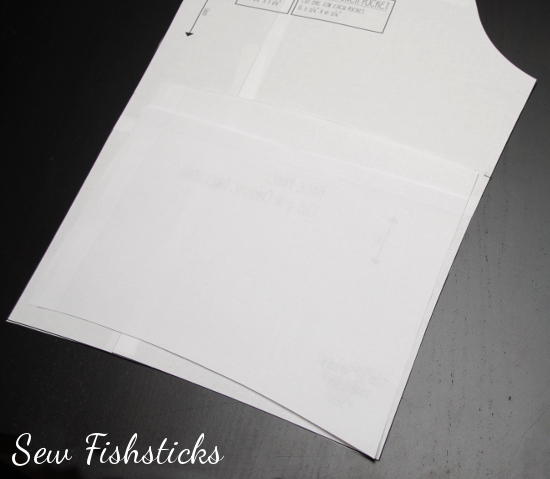 Flip the pocket down away from the zipper and press it lightly. (Be careful because plastic zippers can melt!) 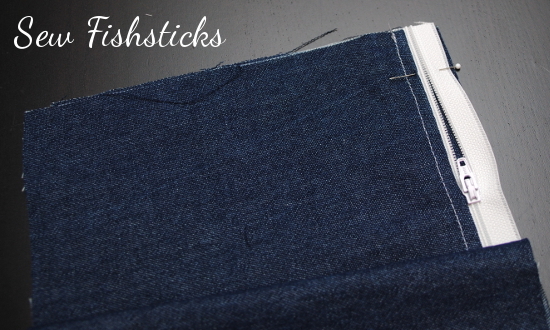 Topstitch 1/4″ from the seam. 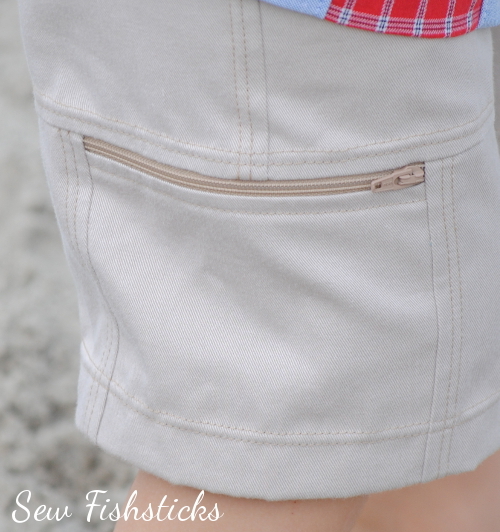 Pull the zipper pull over so that it’s above the pocket and cut away the extra zipper. 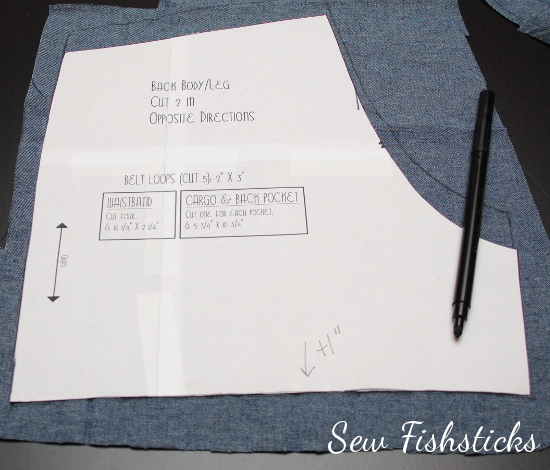 Place the second pocket piece behind the front. 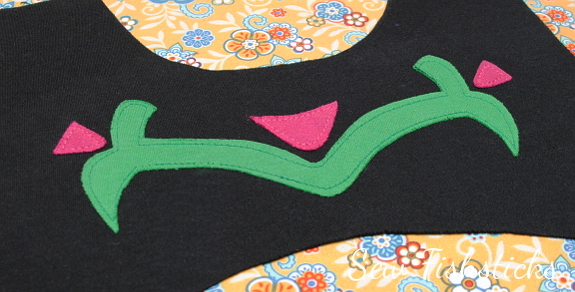 Line up the top edge of this piece with the top edge of the zipper and pin. 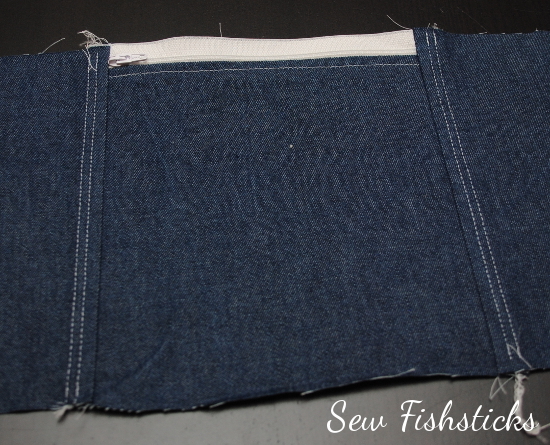 Flip the front piece up at the bottom edge and trim away enough of the bottom pocket piece so that it falls 1/2″ shorter than the front piece. 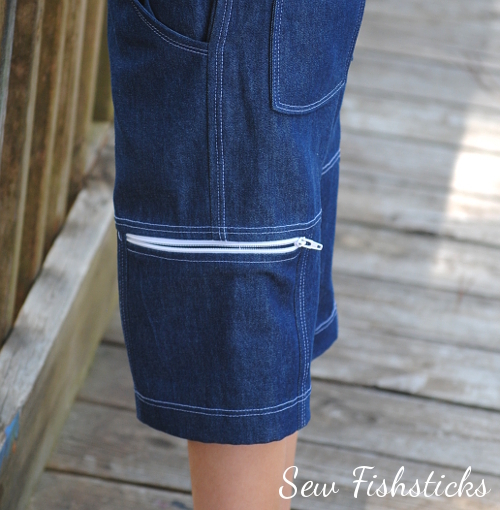 (This will reduce the bulk when you hem the shorts.) 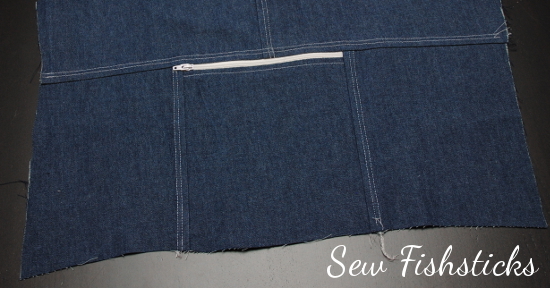 Sew the back wrap-around panel piece to the back side of the pocket. 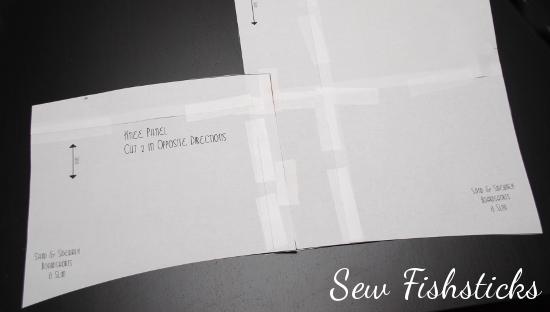 Serge or overcast your seam allowance to prevent fraying. Before sewing the front of the wrap-around to the pocket, pull the zipper pull back and pin the zipper teeth close together. 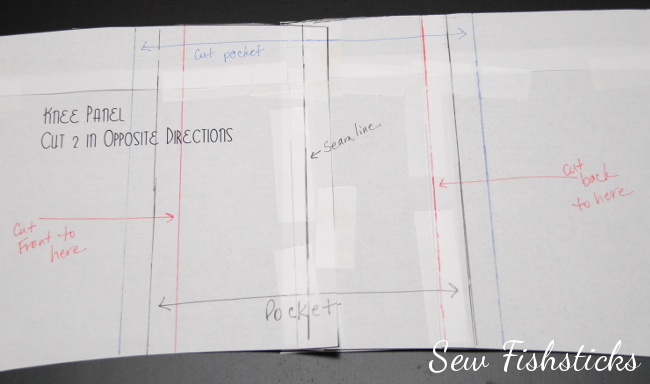 Sew the front of the wrap-around piece to the pocket. 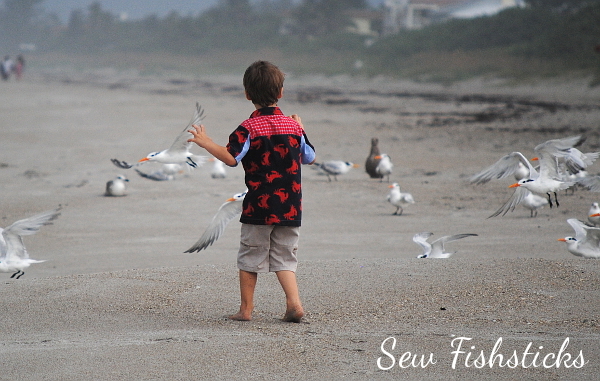 Serge or overcast the seam allowances. 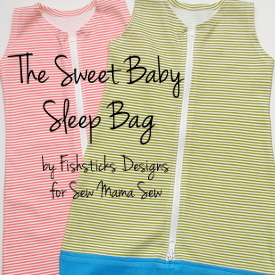 Pull out that twin needle and topstitch down both sides of the zipper. 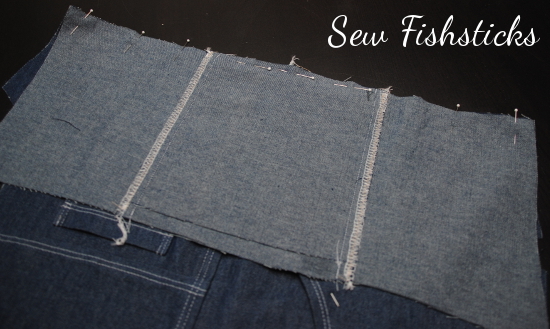 (Or just sew two rows of side-by-side topstitching.) If you haven’t already assembling the top portion of this leg, do so now. 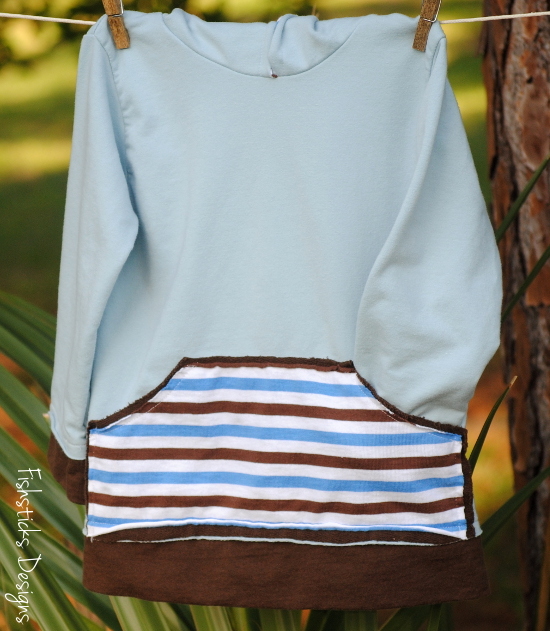 (This top portion looks slightly different than the pattern because it’s the modified version that I did for Project Run & Play.) 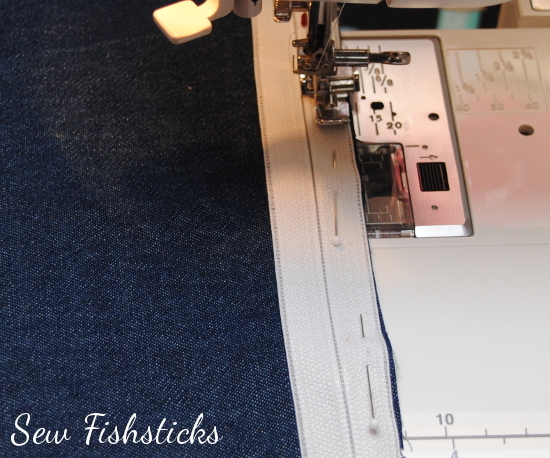 When you pin the wrap-around panel to the bottom edge of the top portion of the leg, pin the top edge of the zipper in the same way that you pinned the bottom edge of the zipper earlier. 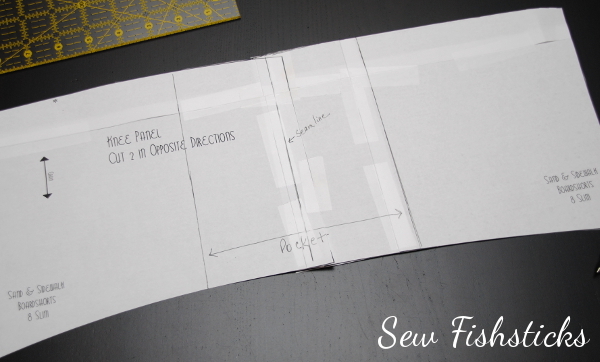 This time the zipper will be sandwiched between two layers of fabric, so be careful to line up the three edges evenly. 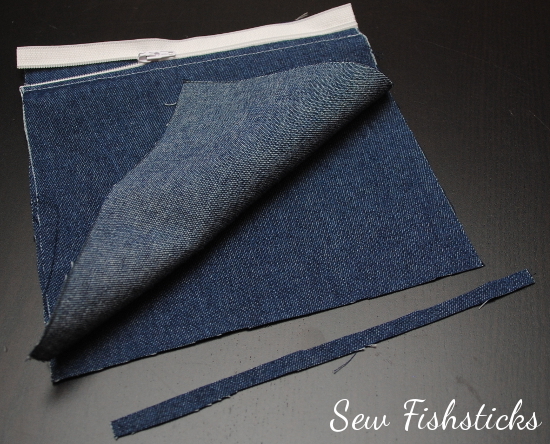 Sew the pieces together using your zipper foot with the same settings you used for the bottom of the zipper. 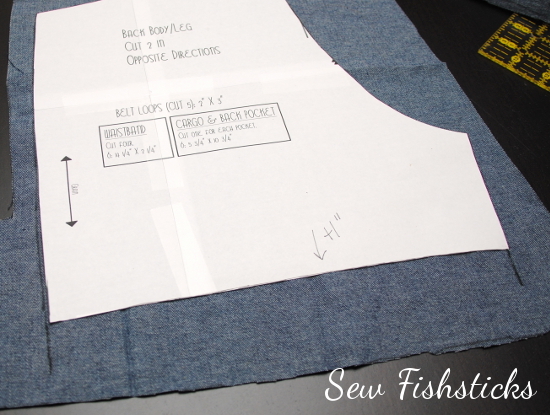 When you overcast or serge this seam allowance, you’ll need to open the zipper, go part-way, stop, pull the zipper past and start again where you left off. 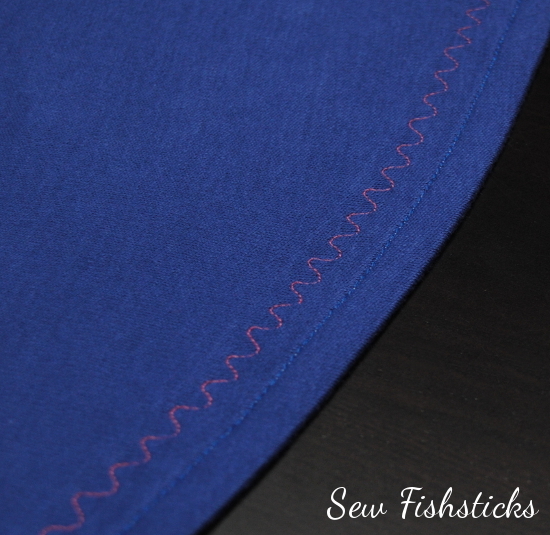 Topstitch above the seam using a twin needle or stitching two rows of side-by-side stitching. 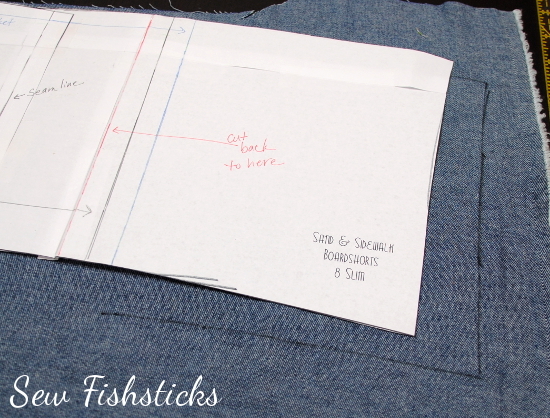 From here, you’ll do the other leg, then follow the instructions in the pattern to complete the shorts. 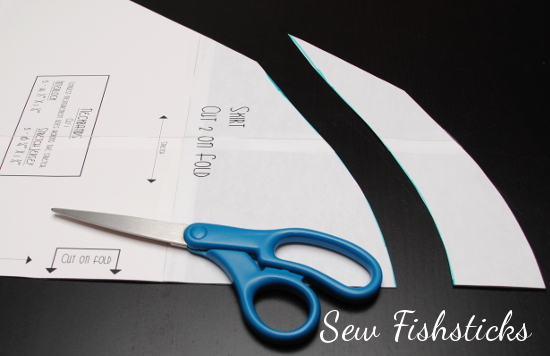 Be careful, though, when you line up the inseams the make sure that the wrap-around seams are lined up as closely as possible. That wasn’t too hard, was it? A few little tips/notes: first, I didn’t put this together in a PDF, but my blog has Print-friendly button at the bottom of each post, that will make it easier for you to print if you prefer. Second, because you’re basically drawing in your pattern and you’re not a computer, you may get edges that don’t quite line up. 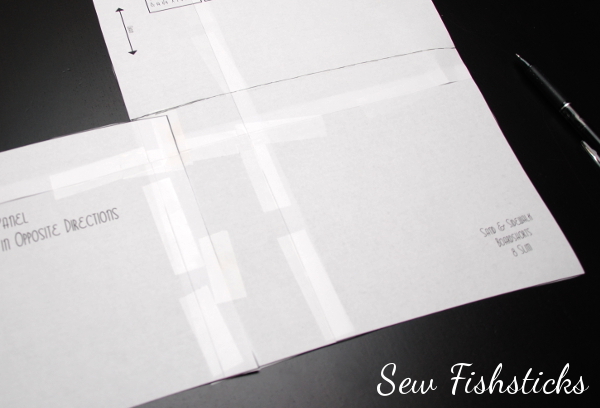 As long as they’re small pieces, just trim them so that they do line up and move on. Those little tiny misalignments aren’t going to affect the fit of the final piece. 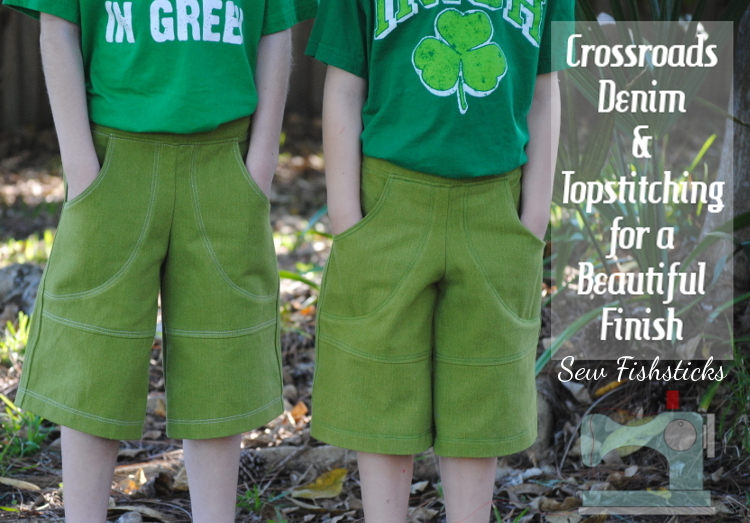 Go sew some cool shorts! And, then share them with us! 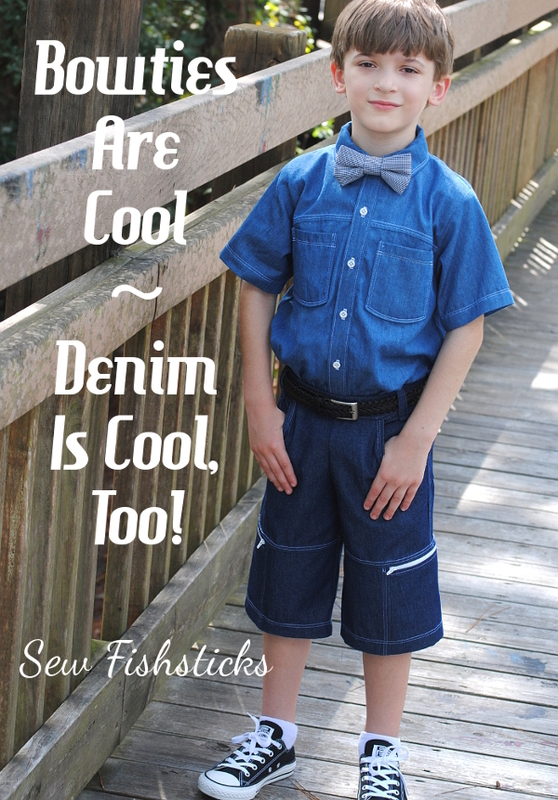 We would love to see them in the Fishsticks Sewing Group or on the Fishsticks Fan Page or tag me on Instagram! 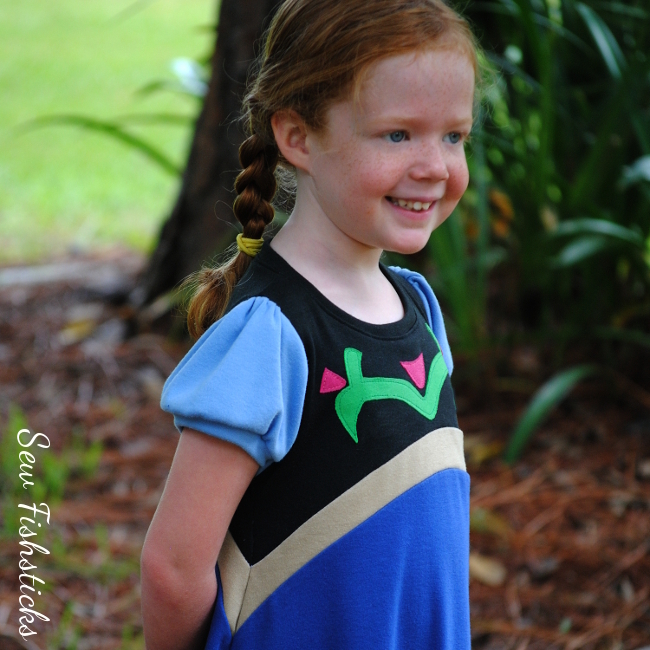 I am so excited that my Playhouse Dress is part of Perfect Pattern Parcel #5!! 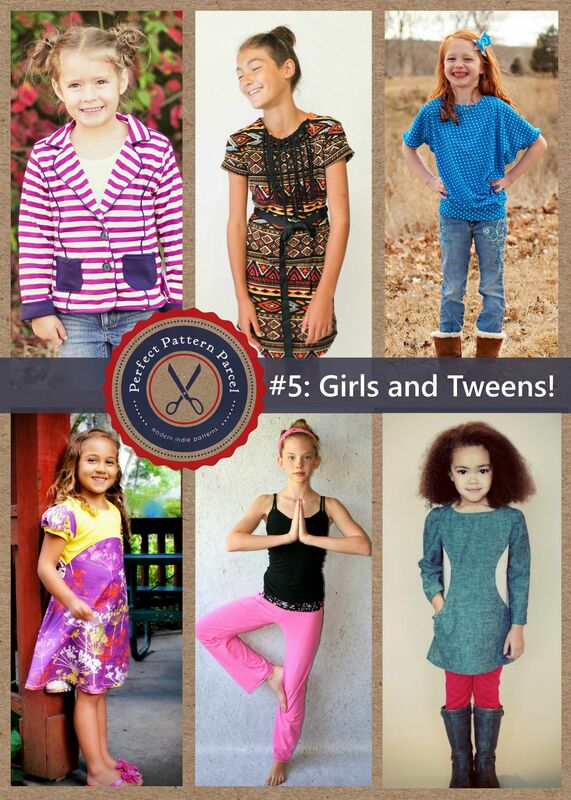 This collection includes six beautiful and versatile sewing patterns for girls from preschool to preteen. 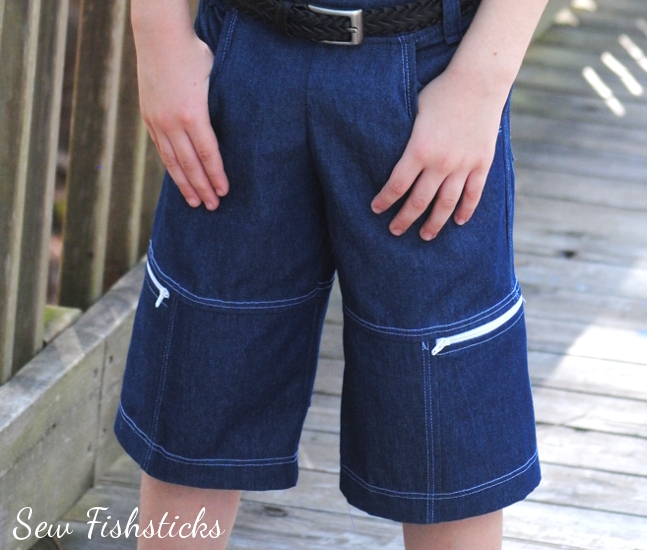 Here at Perfect Pattern Parcel, we believe in supporting independent pattern designers. 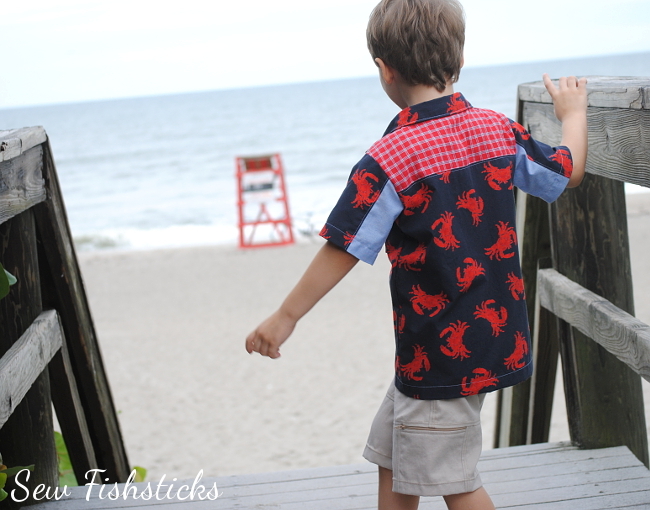 It’s our opinion that indie patterns are just, well, better than big box patterns, and we’re pretty sure our customers think so too. So, we allow customers to show their support in naming their own price for each Parcel. We also encourage customers to allocate part of their Parcel price to the charity Donorschoose.org in order to help classrooms in need. 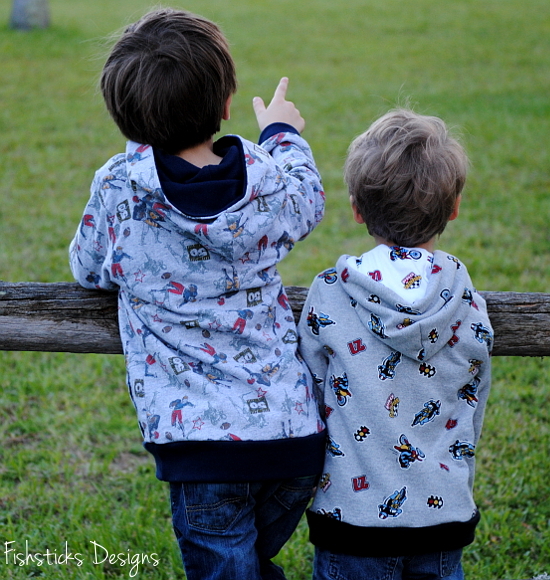 Pattern Parcel donates all profits after expenses from Parcel sales to the charity as well. Together we’ve raised over $11,000 for classrooms in need! My house is full of little boys, but I’ve heard that there’s this recent movie that little girls have gone a little bit crazy over – a movie about a certain ice princess and her little sister. 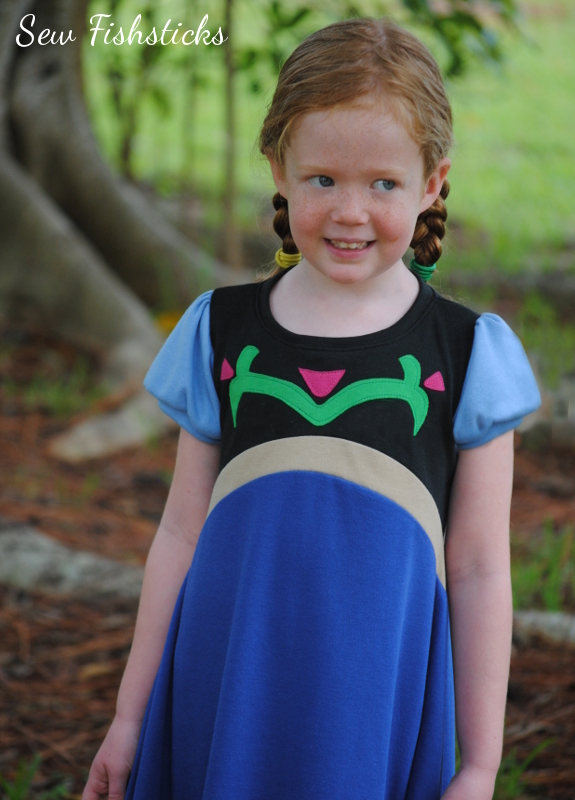 Because I’m a practical sewist, I don’t generally do costumes, but for our recent trip to the Magic Kingdom, I made a princess-inspired Playhouse Dress for our granddaughter. You can see that dress right here. I love that it’s a play dress that she can wear everyday, but it still makes her feel like she’s dressed up! 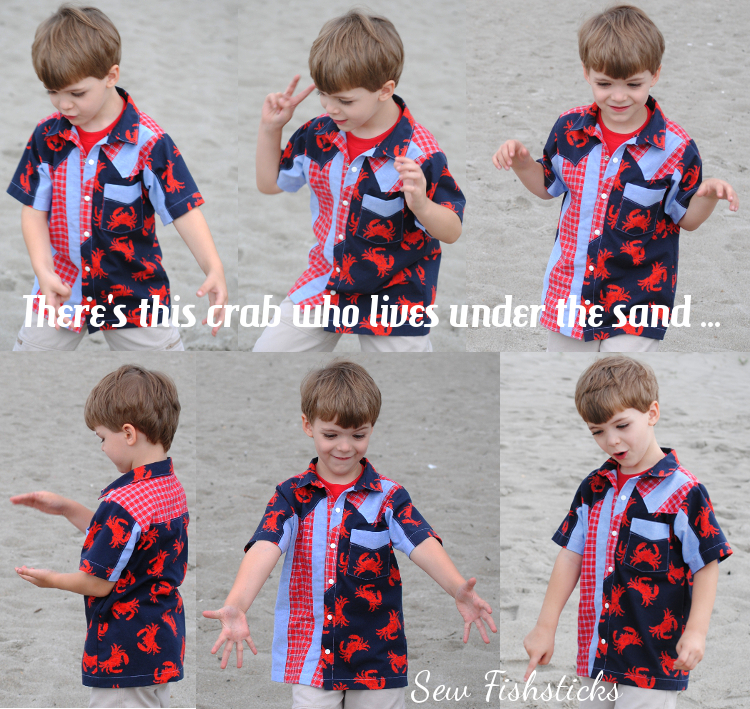 (If you’ve ever gone to the grocery store with a child in dress-up clothes, I think you’ll totally understand!) 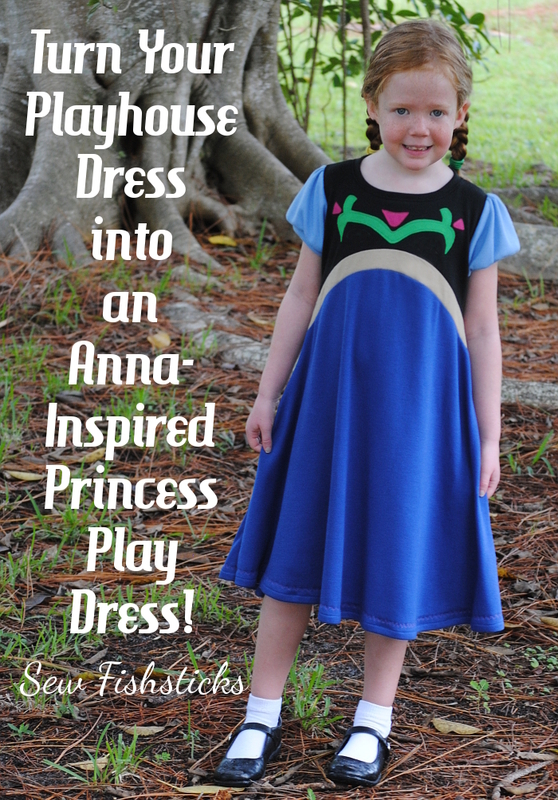 For the Pattern Parcel Blog Tour, I thought I’d show you how you can do the same thing by creating an Anna-inspired Playhouse Dress. 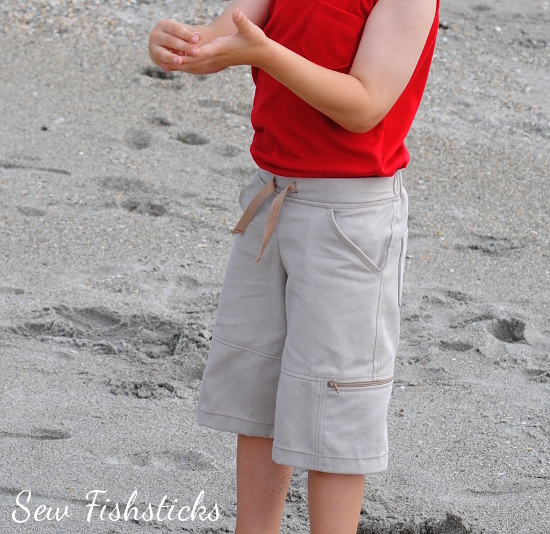 I’ve got all of the instructions for you, plus a downloadable PDF for the simple applique. 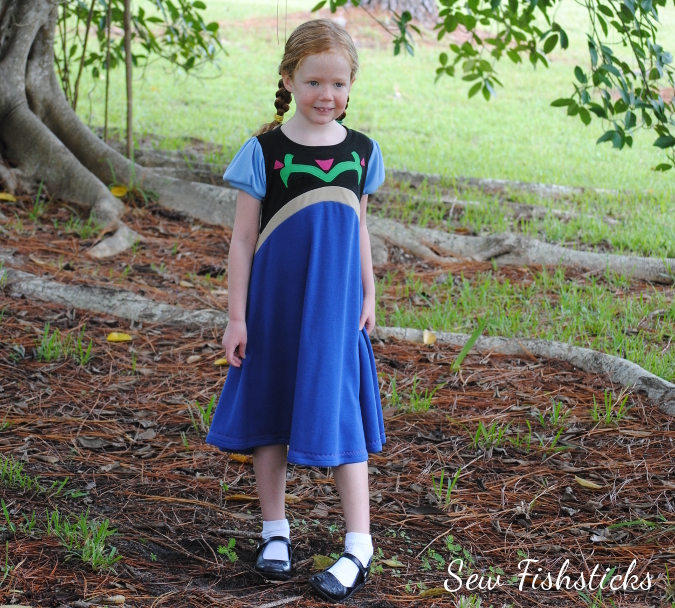 You can sew the Playhouse Dress in a combination of knits and wovens or in all knits. Because I wanted this one to be a casual princess-y dress, I sewed it in cotton/polyester interlocks, and I bought them all at Joann Fabrics. I used Black, Fern Green, Sangria, Cornstalk, Royal and Cornflower Blue. 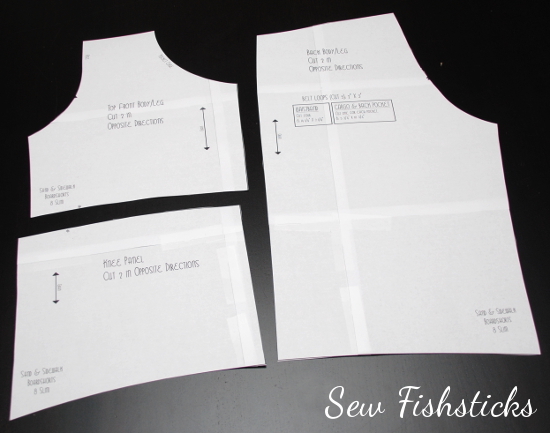 Start by printing and assembling your pattern. 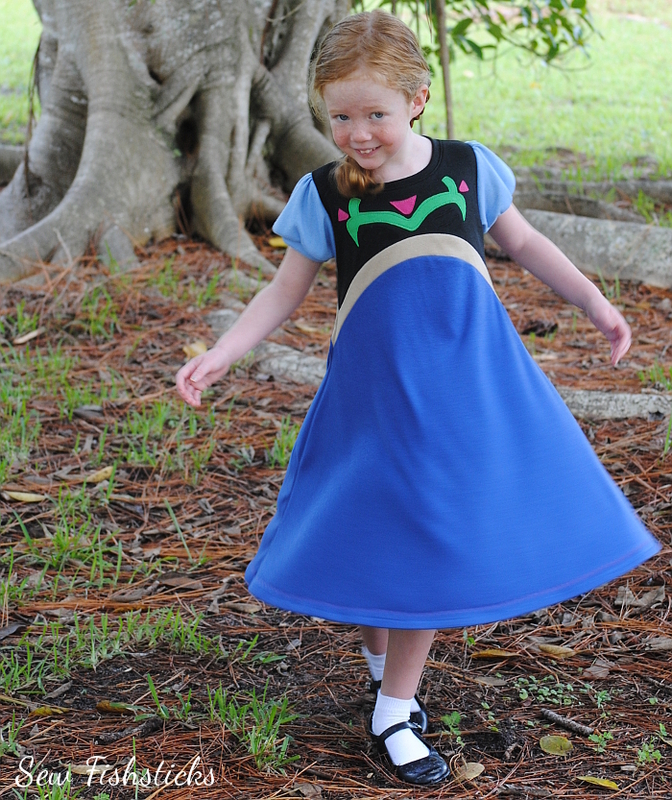 The Playhouse Dress is one of my updated patterns, so you can choose to print either all sizes of the pattern nested, or just the individual size that you’re sewing. 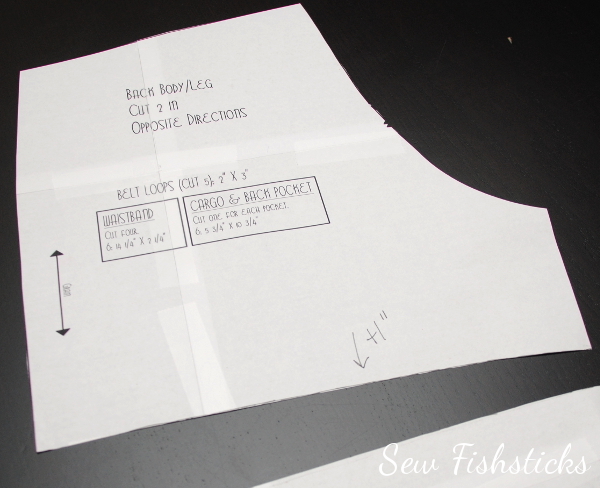 In addition to printing the the entire pattern, you’ll need a second printing of just the top section of the skirt. I’ll explain that a few steps down, though. 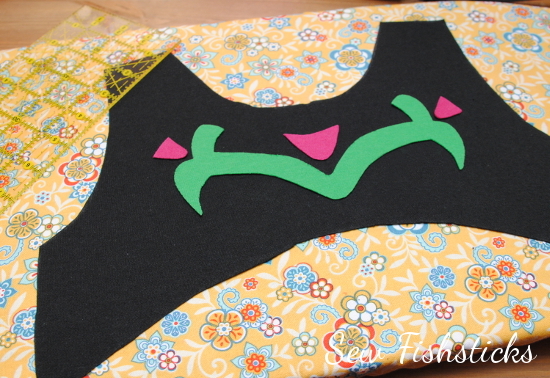 You’ll also need to print the applique design. Click here for sizes 12 months to 4 (on sizes 12 months and 18 months, the center flower is left off) and here for sizes 5 to 12. 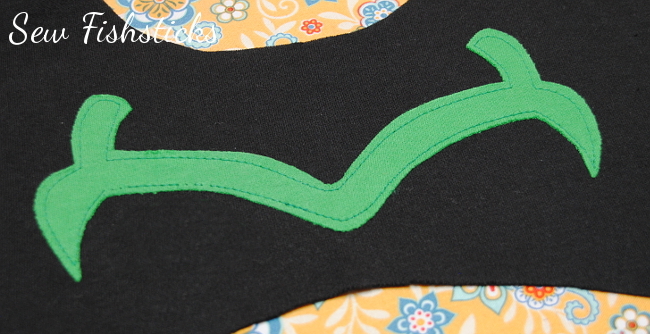 Finally, you’ll need a sewable, paper-backed, iron-on adhesive for the applique. I used Heat ‘n Bond Lite. Choose a price of $28 or greater for Parcel #5 and you will automatically also be sent the Bonus Pattern. 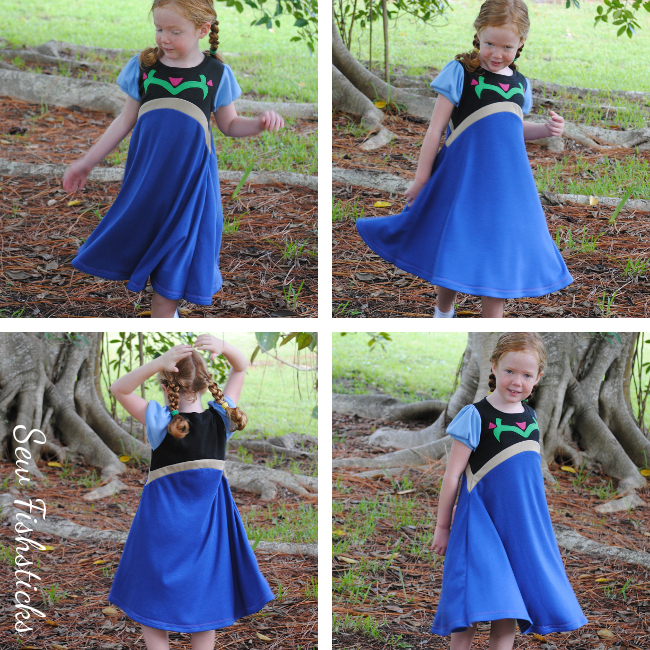 The Bonus Pattern for this Parcel is the Sunki Dress by Figgy’s. 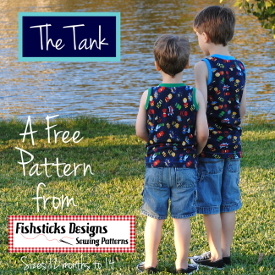 The pattern includes both size runs, so you get 18 months through a 16 tween sizing.